Now we were on our way downtown hunting for the Elliston Place Soda Shop circa 1939! We passed Vanderbilt University and ended up in a cute little part of town where lots of students were wandering the streets...it was your typical university area! We found the little soda shop and it was pretty cool! We ordered sandwiches and the manager was so nice that I ended up interviewing her for a future Vintage Indie article! Turns out that Hank Williams Jr. even did an album cover there and they showed it to us! How fun is that? Now that we had some nourishment we were ready to tackle finding the Goodwill Outlet Center again! Little did we know just how frustrating that would be! We drove in circles trying to find 8th and 9th streets which had somehow gotten renamed plus I simply cannot read a map. Hands down, not a map reader. I always get turned around and roads end for no reason that are on the map, well, you get the idea. We saw the Parthenon on the way. FINALLY we find the Goodwill. Hidden around a corner from the Dollar General store. We had exactly one hour to dive into the biggest cardboard boxes of books I'd ever seen in my life. It was worth it though. I found some great stuff for my etsy shop and especially for ephemera packs! Now, they do get the award for the absolute worst bathroom! One of the very worst I've ever visited and let me tell ya, I've been to a lot worldwide. It was so bad I took a picture of it. So guess what we did Wednesday morning after checking out of Opryland? Yep! 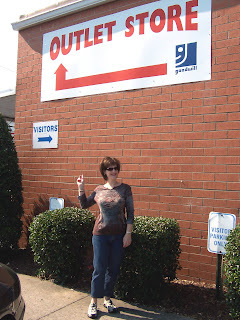 We went back to the Goodwill Outlet Center for 3 hours!! We had the boxes of books to ourselves for quite awhile and then the other book hunters came in. It was pretty funny, we were all kind of helping each other out, like oh, here's a math book, here's a dictionary, here's an anatomy book....I mean when you are literally emptying out such a huge, deep box you might as well make it worthwhile for everyone's sake! They did finally bring some more boxes out and it got a little crazy! More books came home with us!